Lois Graham was one of the first two women to earn a degree at Rensselaer and did so in an accelerated schedule brought on by World War II. She continued her studies at the Illinois Institute of Technology (IIT), where she embarked on a lifetime of contributions to engineering education. Her career at IIT was one of establishing “firsts” for women and breaking down barriers for women in the engineering profession. 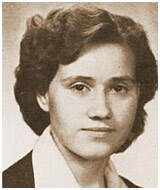 She was the first woman at IIT to earn advanced degrees in mechanical engineering, the first woman in the U.S. to earn a Ph.D. in mechanical engineering, and the first woman to receive a fellow award from the American Society of Heating, Refrigerating and Air-Conditioning Engineers, honoring her for contributions as an educator in thermodynamics and cryogenics. A lifelong mentor and role model, she established IIT’s model program for Women in Science and Engineering, and its Minorities in Engineering Program.